1. Strip the leaves from the rosemary sprigs and place in a pestle and mortar with the chilli. Pound together until well bruised. Rub the mixture over the lamb and set aside for 5 minutes. 2. Cook the lamb under a hot grill for 8 minutes, turning once or twice until well-browned but still a little pink in the centre. Transfer to a plate and set aside to rest. 3. Meanwhile, cook the peas and beans in a pan of boiling water for 4 minutes until piping hot. Drain well, then return to the pan. Add the crème fraîche, then using a hand-held blender, whizz until smooth. Season to taste. Cook the broccoli, butternut and carrot according to pack instructions. 4. Carve the lamb into thick slices. 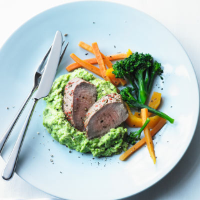 Spoon the pea and bean purée and steamed vegetables onto plates and top with the lamb.